I've just recently added a new collection to my store. This new collection is made of sterling silver materials with clean, minimalistic lines. As the name implies, the "Unity" collection is designed to gently curve and blend into each other, thus unifying into one. As you will notice, the look is more contemporary and modern compared to my earlier work. This ring is the first piece from the collection. I will be adding the necklace, earrings and bracelet soon. This two-in-one, Unity Ring can be worn together for a more dramatic look, or can be worn individually for a simple look. 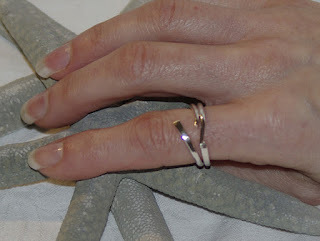 Click here to read more on this great ring.